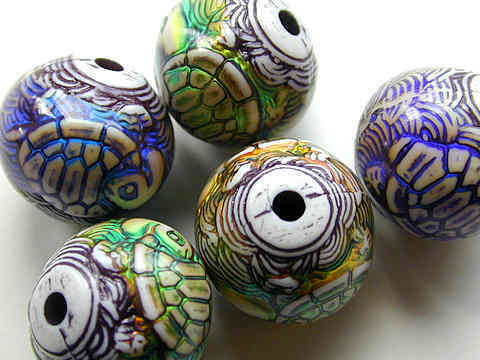 Turtle mood bead is one of our NEW light weight hollow-form polymer Mirage Beads. Mirage Beads are thermo-sensitive and continuously change color, ranging from black (when cold!) through all the hues of the rainbow as they warm. 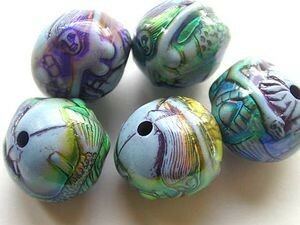 These beads are sold individually. They measure 17.5mm x 16mm with a 3mm hole. Mirage Beads are thermo-sensitive and continuously change color, ranging from black (when cold!) through all the hues of the rainbow as they warm. Mirage beads(tm) come alive with sensuous color as you wear them. Inspired by the mood beads of the '60s and '70s, these thermo-sensitive liquid crystal beads change color with minute variations in temperature. 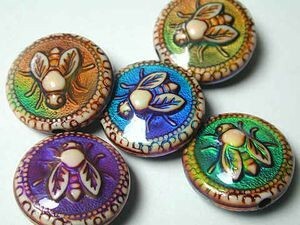 As with life itself, mirage bead are always changing and mysterious. Although very durable, please do not submerge in water.